Ground was broken September 25, 1911. An attractive red brick façade, the first electric baseball scoreboard, and 18 turnstiles, the most in the Majors, were all features being talked about. Concrete stands went from behind first base around to third while wooden bleachers were located in parts of left, right, and centerfield. Seats lined the field allowing for excellent views of the game but limiting the size of foul territory. Elevation was 20 feet above sea level. Barriers and walls broke off at different angles. Centerfield was 488 feet from home plate; right field was 314 feet away. The 10-foot wooden fence in left field ran straight along Lansdowne Street and was but 320 ½ feet down the line from home plate with a high wall behind it. There was a ten foot embankment making viewing of games easier for overflow gatherings. A ten foot high slope in left field posed challenges for outfielders who had to play the entire territory running uphill. This was the Opening Day Lineup for the 1912 Boston Red Sox. The Sox, with player-manager first baseman Jake Stahl calling the shots, nipped the Yankees, 7-6, in 11 innings. Tris Speaker — who would bat .383, steal 52 bases and stroke eight inside-the-park home runs at Fenway — drove in the winning run. Spitball pitcher Bucky O’Brien got the win in relief of Charles “Sea Lion” Hall. The first hit in the park belonged to New York’s Harry Wolter. Umpire Tommy Connolly kept the ball used in that historic game, writing “Opening of Fenway Park” and brief details of the game on it. In 2005, descendants of Connolly offered the ball at auction at New York Sothebys. Hugh Bradley hit the first home run in Red Sox history over the wall on April 26th in the sixth game played at Fenway Park. 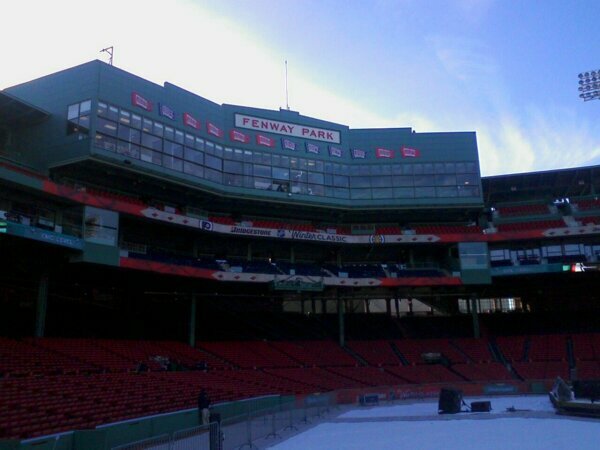 “Few of the fans who have been out to Fenway Park believed it was possible,” the Boston Herald noted. That would be Bradley’s only dinger in 1912.